What happens when a child loses a loved one? Which Way Is Paradise? (2017) is one boy’s journey coming to terms with his grandmother’s death. Gabriel is shocked and confused that his grandmother, who played with him on a daily basis, would suddenly leave without saying goodbye. For a time, he refuses to accept her death. Instead, he believes she is with him, watching over him, helping him solve daily problems, talking to her, and even trying to find Paradise just to be with her again. With echoes referencing William Wordsworth’s “Ode: Intimations of Immortality from Recollections of Early Childhood,” the book explores Gabriel’s experience with premortal and, particularly, postmortal existence. The book is based on a true story. The characters are real; hence, the photographs, but their names have been changed (not for the deceased) to protect the children’s identities. This story is hoping to appeal to those children, older than the protagonist, who have lost loved ones, even pets, and who have had a hard time coming to acceptance of death. Everyone grieves in his own way, and children are no exception. Their denial may be more adamant and their confusion more bewildering: “Is Dad sleeping or is he dead?” Children can’t possibly be expected to understand this profound separation immediately. These children will thrive again—it is the human spirit within us all—despite their sad and lifelong loss. This book suggests an eternal perspective, giving hope of life after death. Which Way Is Paradise? (ISBN 978-0-9742183-1-1) is a 56-page book with 44 full-color, photo-realistic illustrations. 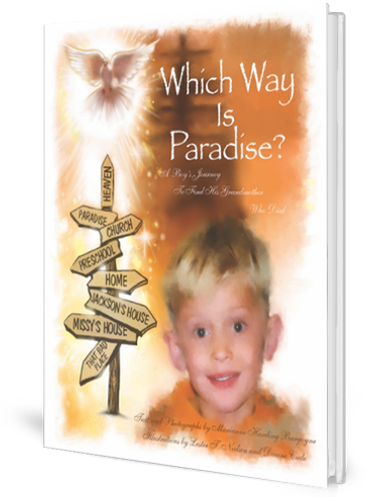 It is intended for children, eight and older, who can read and process the concept of death, and for their parents or significant adults who can read through the book with them, explaining what the reality of losing a loved one means to their family.